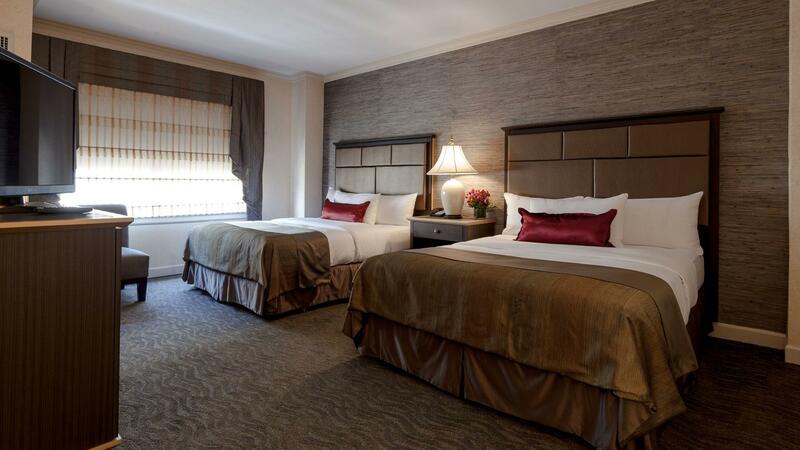 Our luxurious Pinnacle Double Queen Rooms are appointed with two queen-size beds and can sleep four guests. These Chicago hotel rooms with 2 queen beds provide premium Egyptian cotton linens, white silk duvet cover over goose down comforter, exclusive Hypnos cashmere mattresses, new custom furniture and writing desk designed with comfort and style in mind, original three-dimensional artwork, Whitehall signature plush robes, mini-bar, in-room safe, JBL docking station, 42-inch high definition LED television, premium TV channels and cordless phone. Marble bathroom includes hand-placed onyx mosaic tiles with a shower and soaking tub, vanity, luxury bath amenities, and more. These rooms are located on higher floors.